MONTREAL – Making his mark on ice surfaces across the globe for the last decade, Charles Hamelin lives his life at top speed every day. Despite a demanding short track speed skating schedule, Hamelin makes following the Canadiens a top priority when he’s away from home. 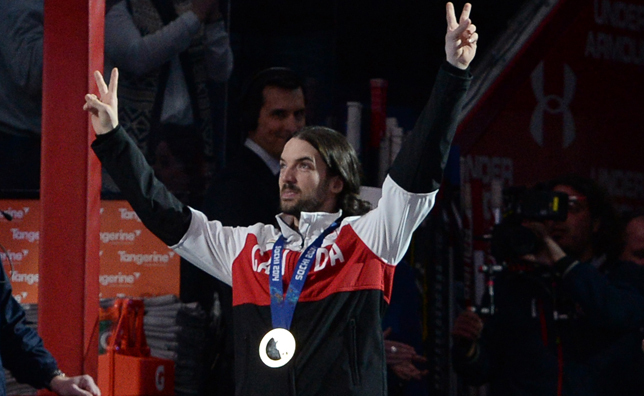 The canadiens.com crew caught up with the four-time Olympic medalist to learn more about his love for all things CH. CHARLES HAMELIN: I’ve been a Habs fan for as long as I can remember. I watched Canadiens games on TV with my dad. I’ve always been a fan of the team no matter what, and when it’s playoff time, that passion goes up a notch. They’re our team. Montrealers are very proud of them. How many times a year do you make it out to the Bell Centre? CH: Despite my hectic schedule, I try to get there at least three times a season. If I manage to get playoff tickets, I know the ambiance at the Bell Centre is even crazier in the postseason. I like taking Marianne [Saint-Gelais] to games because she likes being there to see games in person. When we watch TV together at home, let’s just say that battles sometimes break out over what to watch! (laughs) When she’s at the Bell Centre, she really enjoys the show. CH: I’d have to say the years Alex Kovalev was a Hab. Those were standout years because he was such a spectacular player. When we acquired Thomas Vanek, I told myself that we’d finally picked up a player who was just as electrifying as him. It’s a pity that things didn’t work out the way we thought they would. During the hockey season, you spend the majority of your time outside the country taking part in different competitions. Do you manage to keep up with the Canadiens while traveling and competing? CH: I try to stay as current as possible. Obviously, I can’t watch every game. But, sometimes with the time change, and once I’ve completed all of my scheduled activities after a competition, it’s the middle of the night and we can’t really fall asleep. We grab our computers and watch the games together. The skaters from other countries come over to see what we’re watching. For them, hockey isn’t necessarily their favorite sport to watch. We tell them that we’re watching the Montreal Canadiens. They sit down and watch the games with us and ask us questions. It’s pretty cool. People all across the world know about the Canadiens. CH: I never played organized hockey as a kid, whether it was in the park or in the street with my friends. I started doing short track speed skating because I wanted to learn how to do crossovers on ice. I wasn’t very good at them as a kid. I did all of that so I could eventually play hockey. But, right when I started short track, I fell in love with the sport. It’s safe to say I made the right decision! (laughs) Today, all short track skaters are hockey fans. We play games from time to time, organize hockey pools and follow all of the NHL teams. Are you just as fast in speed skates as you are in hockey skates?